This review has been a long time coming. I've had these since summer and for some reason could never finish swatching all of them. Same thing happened when I bought all those LA Girl Rock Star polishes last year. Anyway, I did finally finish them so here they are! This is the new-ish LA Girl Metal metallic nail polish collection. I am missing one color- Pink Steel. I know I'm not much of a pink wearer, but I'm actually kinda bummed out that I didn't get to swatch that one. Alkaline Blue. Bold blue foil. Very dense silver-based foil finish. Antique Gold. This is almost more green than gold! Completely gorgeous. Many different shimmering iridescent particles combine to create this golden tarnished olive color. Brass. Not so much brass as it is dirty rust. Very odd and unique color- silver-based foil with heavy brown creme type pigment... Definitely don't see many like this. Bronze Medal. Little bronze glass fleck type particles in a sheer base. 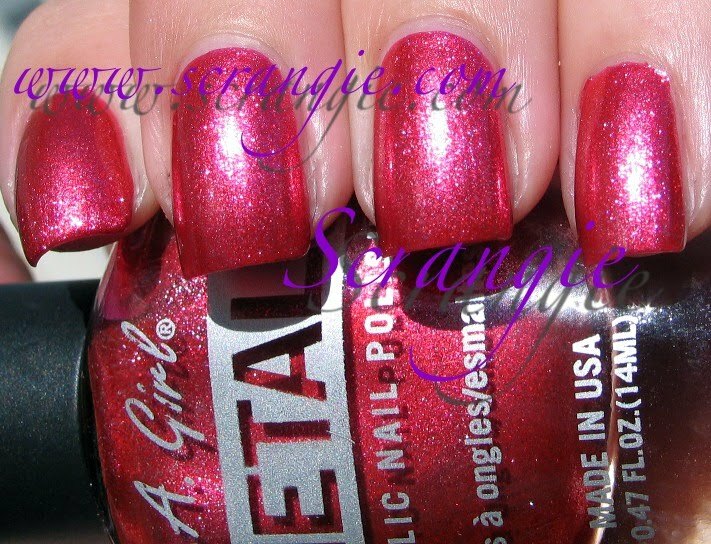 This is one of the more sheer colors in the collection and you're seeing five coats in this picture. Nice end result but took a lot of work to get there. Chromium Green. This color appears more blue in my pictures than it looks in real life. Though, in real life, it is actually more of an aqua/turquoise than a true green. Very pretty shiny dense foil finish. Copper Alloy. Ugh, I can't even stand how pretty this is. Look at how rich and Autumn-y that color is! It's copper and red and rust with gold highlights. So much depth and sparkle. Looks like it's on fire. Total surprise love for me. Deep Sea Mica. Deep blue/green duochrome shimmer. I don't know if I'd really call this metallic, it has a bit of a glass fleck look to it but the particles are very small. 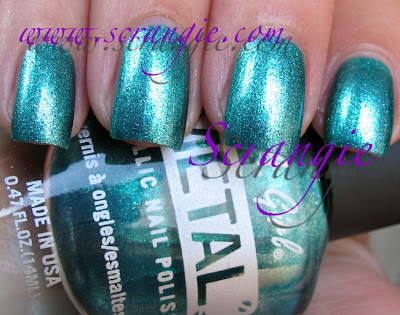 This one is also a bit sheer, it needed four coats, but it's easily layered over another blue or green. Gold Plated. Warm gold sheer foil. Sheer foil is an unusual description, I know, but it's right in between a true foil finish and a glass fleck metallic like the Milani metals. Graphite. Great name for this color. Dusty charcoal grey foil. Silver based. Very opaque. Iron Red. This one is crazy. I wouldn't call it red as much as I'd call it magenta or deep pink. It has so much color for a foil. Yes, it's silver based and foil finished, but it's so freakin' bright! Weird and awesome. 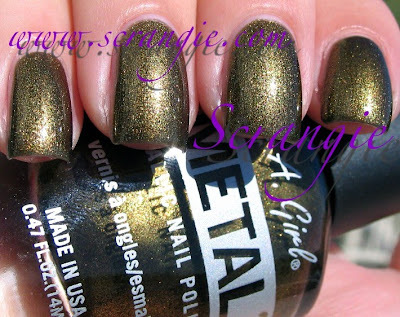 Metallic Olive. If you like green, you need this. I don't know if 'olive' matches this color. I'd call it evergreen. Leafy. Not really olive-y. Many different tones and colors- tiny iridescent green particles. Sooooooooooo pretty. Millennium. 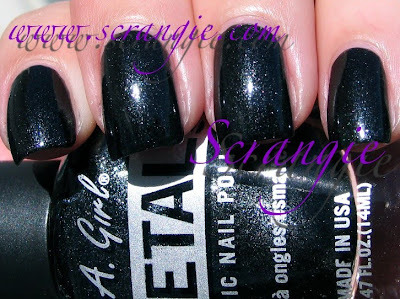 Deep purple foil. Another color you don't see that often! I don't have another polish in my collection that matches this. Very dense and opaque. Very purple. 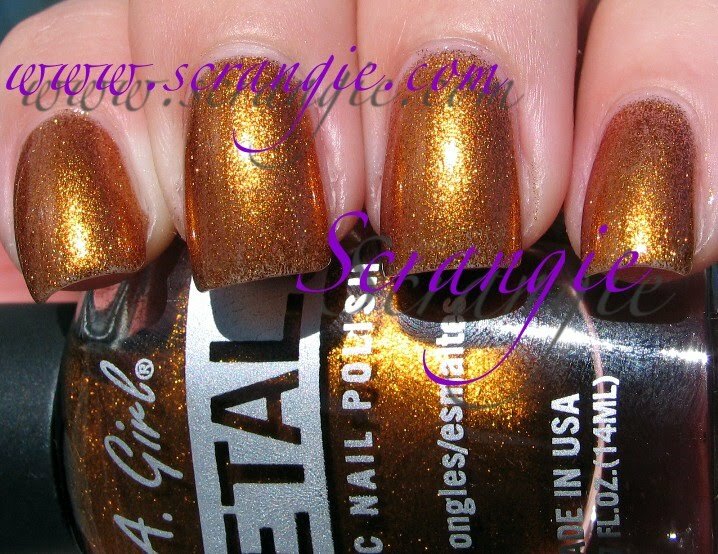 I'd definitely recommend this one, too, if you're looking for unique colorful metallics. I bet this would Konad well. Obsidian. Black with silver metallic flecks. Trilogy. This collection is full of weird colors. This is a mauve-mulberry-purple foil. Kinda funky, definitely unique. Seems to have a bit of warm chestnut tint to it as well. The formula on these is very hit-or-miss. Some are super opaque in one coat, others need 4 or five coats, while the rest look fine at two or three coats. There doesn't appear to be any consistency in the formula. Some are quite thick and almost gel-like in texture. The drying time is long, but they seem to wear pretty well once they're dried. Some really gorgeous colors in this collection. The greens and the purple Millennium shade are especially nice. Silver and gold foils are rather common, but they do have their place in this set. Copper Alloy was a nice surprise, too. At $4 a piece they're quite an inexpensive polish. The formula isn't perfect but some of the shades are totally worth getting. I've heard that you can find this brand in some dollar stores, but I've never seen this particular collection anywhere but LA Girl's website. I have ordered from them before and everything arrived safely and fairly quickly. Which reminds me, I've been meaning to order some of those Disco Brites that I keep forgetting about... They glow under blacklight! i wonder how they look mattified? These look great!! I actually swapped Alkaline Blue and Brass... they didn´t really excite me. 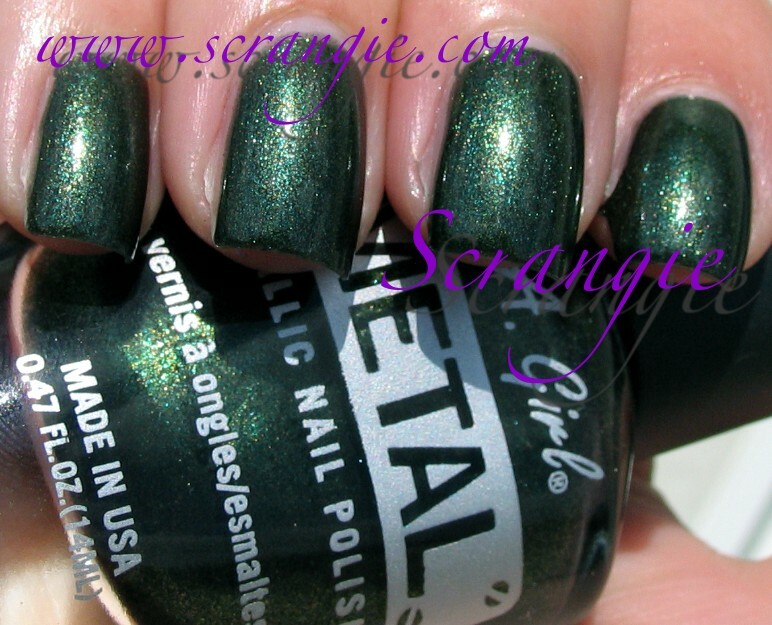 But especially Millenium and Metallic Olive look stunning! 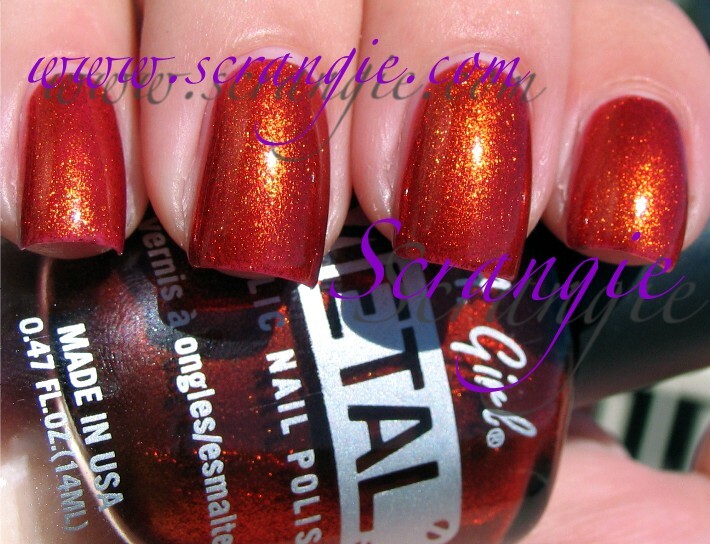 You can buy the Metal line online at Cherry Culture for $2.80 or Discount Cosmetic Outlet for $2.51 (sale price) which is where I purchased mine. The Pink Steel is not very different from L.A. Girl Nail Lacquer in Metallic Pink, slightly darker pink and glossier. To me they both look like silver micro glitter in a pink base. Ohhh Disco Brites sounds cool! :) I've heard some of these are dupes for Forever21 polishes? Graphite is awesome for konadding! I have and love several of the blue-green shades, but WOW, I think I need Copper Alloy now too! FYI, I have seen these at every Fred Meyer in my area recently (a grocery/drugstore/clothing/etc. type-chain in the Northwest). Wow! And again amazing colors and swatches! I already have 10 of these but I may need a few more, Brass looks really interesting! I love this collection! I like this collection. So far I found all my LA Colors at the Dollar Store. Maybe I'll be lucky and find them there later. I JUST placed an LA Girl order yesterday and skipped over most of these because I couldn't find swatches and didn't want buyer's remorse. I only got Antique Gold. I really wish now I had gotten Brass...it's gorgeous! dayum! bronze medal is hot! I only have antique gold, but I think I might need to do a Cherry Culture order STAT! Would you be so kind and tell me where do they have their names? I just got one from a swap, but there is nothing on the bottle. I am not sure whether I have Chromium Green or Deep Sea Mica.. Thank you. It must have fallen off then..
Love the sterling silver & with a quick dry top coat, it lasts thru thick & thin. Only needed 1 coat altho I put a 2nd for strength. LOVE, GOTTA GET MORE COLORS BUT NOT SHEER ONE'S. Love the sterling silver. With coat if quick dry clear top coat, lasts very very well. Want more but not sheer one's. Highly recommend the silver!